Little bugs that cause big problems. Termites cause more than $2 billion in repair cost for damages each year nationally. Due to our warm, humid climate, Upstate South Carolina and western North Carolina are considered termite “hot zones” with higher infestation levels than most other areas in the U.S. Unfortunately, most homeowners do not consider termite protection on their homes prior to experiencing an infestation. And sometimes, that can mean big trouble. In Upstate SC, the only termites present are subterranean termites. These termites live underground, which requires them to build shelter tubes from the ground to their source of food [your home or business]. During these inspections we inspect the interior of the garage walls, the interior walls of the residence, the exterior walls and the crawl space or basement for any signs of the shelter tubes or damage. The biggest mistake homeowners make is not having their homes inspected yearly. Even homes that have been treated for termites can experience an infestation if the treatment fails. Inspecting the property annually will catch the problem before extensive damage is done. Another mistake that homeowners make is thinking slab homes are free from termites. Actually, it is harder to detect termite activity in slab homes, meaning damage is often done before the termites are noticed. In slab homes, termites gain access through the plumbing pipes, cracks in the slab, expansion joints and the exterior walls. In crawl space homes we can detect termite activity usually before the damage is extensive because of the distance the termites have to build their shelter tubes before reaching the wood substructure. A Termite Protection Policy is just as important as your homeowner’s policy. And at Patriot Pest Management, we know how to keep your home or business free of these damaging pests while being conscious of our impact on the environment. Industry regulations have lead to the development of newer, environmentally safe baiting systems to eliminate termite colonies. These advances in technology have now given professional pest control companies the ability to effectively & safely eliminate termites rather than simply creating a chemical barrier around your home. Unlike Patriot Pest, most pest control companies use weaker, outdated and less effective methods to treat your home for termites that are designed to create larger profits for the company, as well as insuring the need to re-treat your home regularly, costing you even more money. Two of the latest, most effective methods we use to ensure the elimination of termite colonies are Advance Termite Baiting System and Termidor, the leading liquid termiticide. Advance Termite Baiting System: This effective extermination system targets the “worker” termites that constantly gather food for the colony. 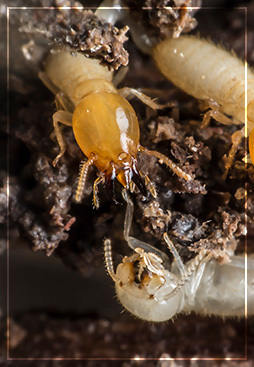 These worker termites feed on bait cartridges located in ground stations around the home. They share the bait with other members of the colony eventually destroying the colony completely. Once the colony is eliminated, the baiting system acts as a security field that continually monitors any further activity and stops any future termite attacks. This system is one of the best ways to insure total safety for you, your family, your home, and the environment. Termidor Liquid Termiticide: This is a liquid based termiticide which is applied to the soil around the foundation of your home, including inside walls, along piers, under slabs (by drilling), in voids, etc. Termidor is a non-repellent termiticide which provides the quickest solution to a termite infestation. It relies on a non-repellent treatment feature that termites are unaware of. Any termites which come into contact with the substance carry it back to the colony where it is transferred to the other members during their “grooming” process. As it spreads, it effectively eradicates the colony completely. Click here to read “The Patriot Difference” in termite control.